This is the first post in a series about defending Wing-T offense. There are no absolute definitions in football and the answers to what is a wing-t offense vary. This series will NOT cover every element of every wing-t scheme everywhere. With that said, this first post is about knowing your enemy. To stop the wing-t, it is important to understand a wing-t offense’s philosophy. Much of this post is based on concepts from the book “The Delaware Wing-T: An Order of Football” by Tubby Raymond and Ted Kempski. Countless football coaches have been influenced by this book. The book covers the history and evolution of the offense. The chapter on coaching psychology applies to coaches of offense, defense, or special teams. Coach Raymond covers the offense’s philosophy, organization, communication, naming structure, play calling, position coaching for all positions, installation, teaching progression, practice planning, and of course the plays. It is a comprehensive how to manual for running the Delaware Wing-T offense. Other topics covered include identifying and attacking defenses. The impact of this book is far greater than simply the wing-t scheme. Many of the coaching concepts apply to any offensive system. I believe this book is a must read for any football coach. The book was published in 1986 and is still impacting coaches today, including Gus Malzahn at Auburn. 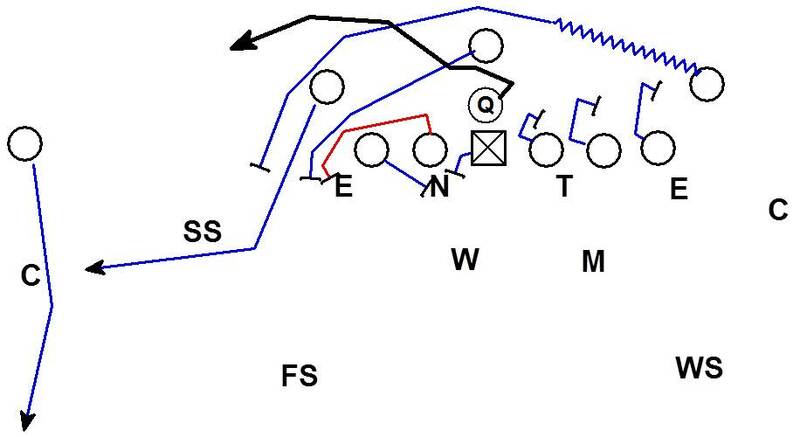 While Coach Malzahn does not run a dedicated wing-t scheme you can see traditional wing-t formations, motions, and plays that are staples in his Tiger offense. For more info on Coach Malzahn’s wing-t roots check out a very interesting article from Chris Brown (here). 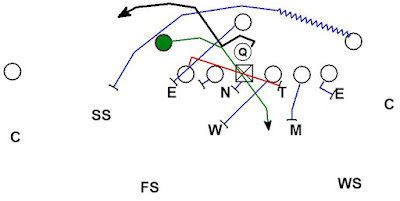 The wing-t is a multiple formation, multiple back, ball control offense. 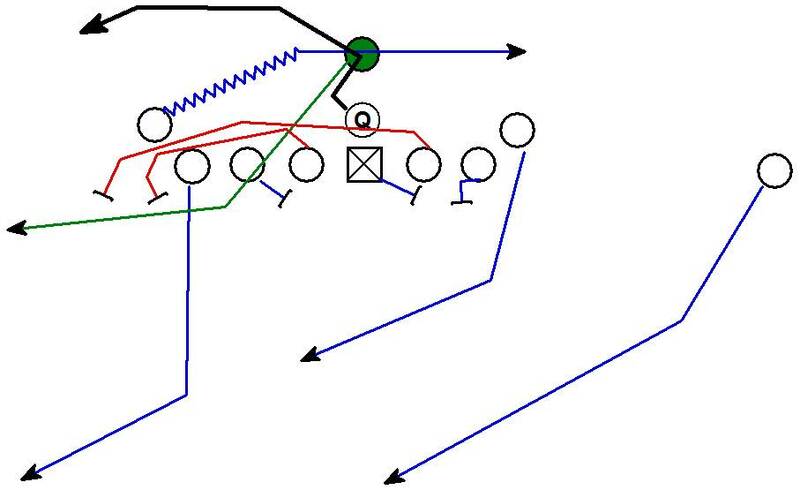 The scheme is focused on running the ball and creates a run/pass balance with mostly play action passes. While a running offense, the wing-t wants to present three or more immediate vertical pass threats. Here are two common wing-t formations. 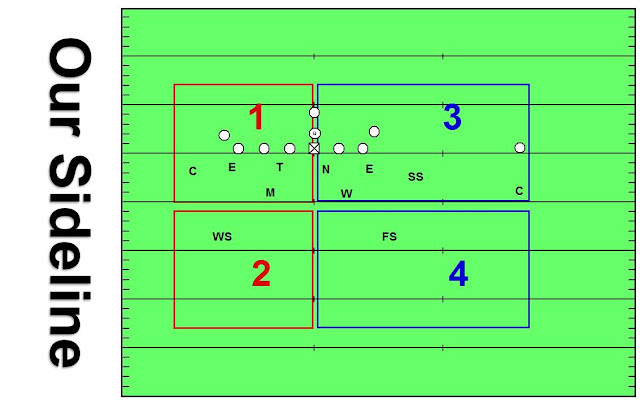 Having three or more pass threats differentiates the wing-t from traditional three back backfield concepts like the T or Wishbone which only present two immediate pass threats. Conceptually this thought process is no different from spread offenses. Many spread teams align spread to RUN the ball. Spread teams present the defense with a formation that forces horizontal stretch and threatens vertical pass to create space to run the ball. Both the wing-t and spread offenses are trying to prevent the defense from loading the box with defenders and playing aggressively to stop the run by aligning immediate pass threats at the line of scrimmage. There by creating run/pass and leverage conflicts for defenders. Wing-T formations also affect the width of the defensive front’s alignment. If the defense aligns inside, the offense has excellent angles to block down. Here the defense has aligned the DE inside leverage on the TE. The TE and Wing have excellent angles to down block and the offense can attack the outside of the defense. 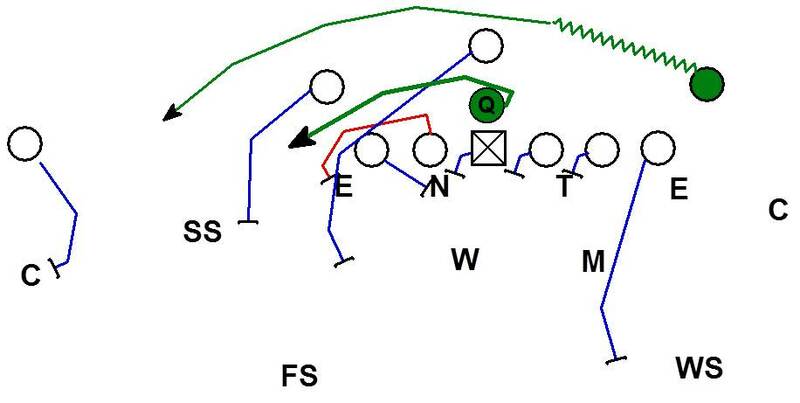 If the defense widens to the formation, the offense has space to run inside or off-tackle. Here the defense widened the DE to the Wing. This extra width helps the offense set up the kick out block by the guard on the DE. 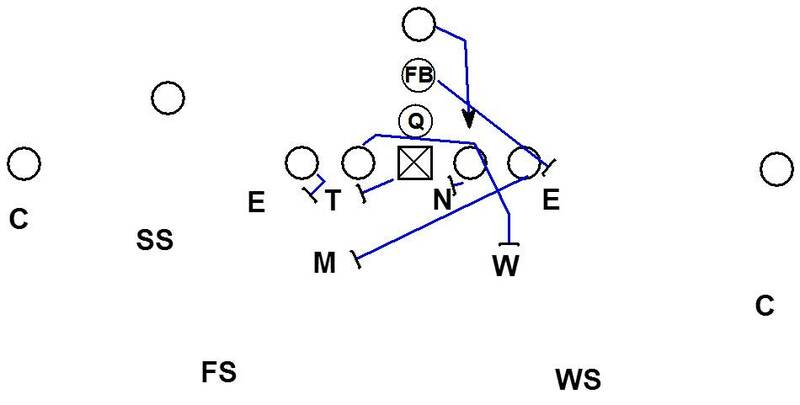 The Wing can step to the the DE and influence the DE to put hands on the immediate block. The Wing then releases to block the second level and the guard pulls to kick out the DE. In the Wing-T extra blockers are aligned at or near the line of scrimmage. The offense can use them to block immediately. This allows the offense to threaten out leveraging the defense. On runs to the tight end the wing can help the offense quickly secure the edge. 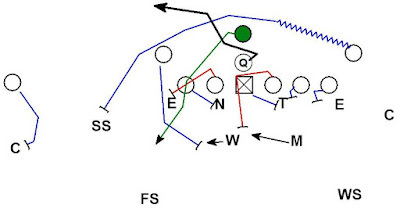 On runs to the split end the back can be offset in the backfield or aligned in a wing alignment off of the tackle. In either alignment the the offense has a blocker who again can quickly secure the edge. When you compare the wing-t to common two back run games you see a similar threat found in H-Back or offset FB offenses with one major difference. Here is a standard two back pistol formation using an H back aligned on the hip of the OT. The H back is assigned to kick out the DE on power. 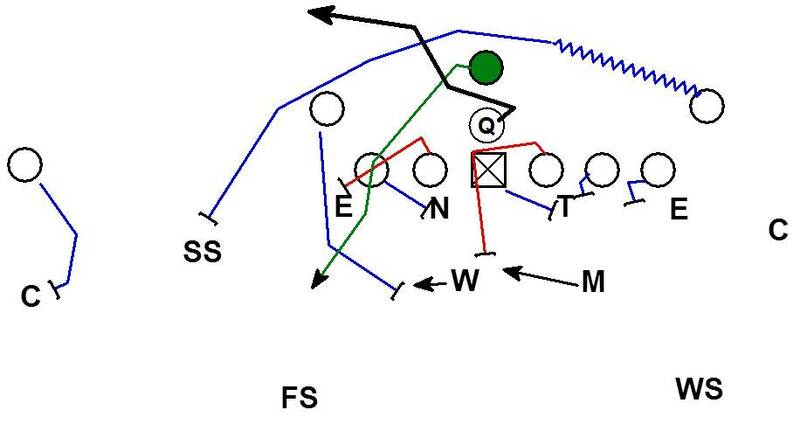 The DE has significantly less time to react to the H back's block compared to the same play run from the I formation. 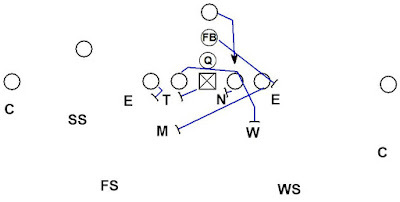 An offset fullback serves the same function as an H back. Here the offense is running outside zone with an offset FB. 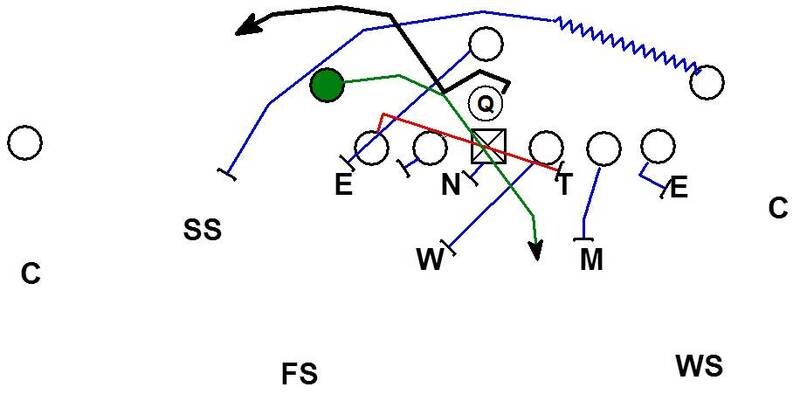 The FB is able to attack the edge of the offense much quicker than the same play from an I alignment. If these plays attack faster with an H back or offset FB why run them from the I? The easy answer is the offense can run the play both directions from the I and can only run it one direction with an H back or offset FB. This is a challenge two back running attacks have always faced. Be able to attack both sides or attack more quickly is a choice that must be made. At the core of the Wing-T offense's philosophy is the ability to have these quick blocking threats on BOTH edges so the offense can run either direction. Dealing with quick blocking threats on both edges is a major difference between defending Wing-t and defending two back running schemes. The formations also allow the offense to quickly motion and attack with the extra motion player to the opposite side of the formation. 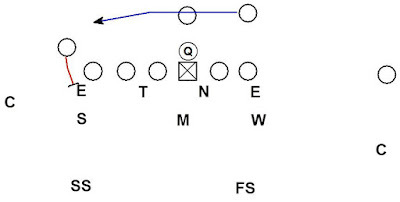 Here the offense motions the left back and runs buck sweep to the TE side. 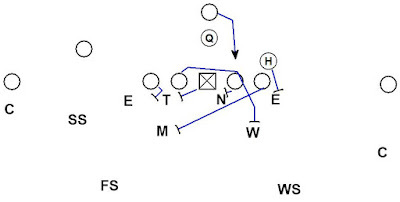 Here the offense motions the right back and runs belly option to the SE side. 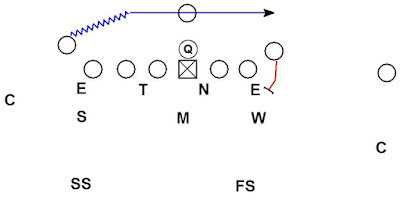 Most Wing-T offenses use formations with a fullback. The FB presents an immediate running threat to attack the middle of the formation, over both guards, or off either tackle. By aligning the FB behind the center, the offense can use the FB in the run to either side of the formation as a ball carrier or blocker. Coach Raymond compares the FB’s ability to attack either side of the formation to an I formation. 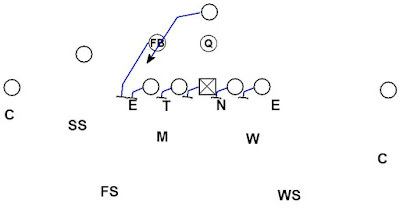 The FB in the wing-t can fill the role of an I formation fullback or I tailback. 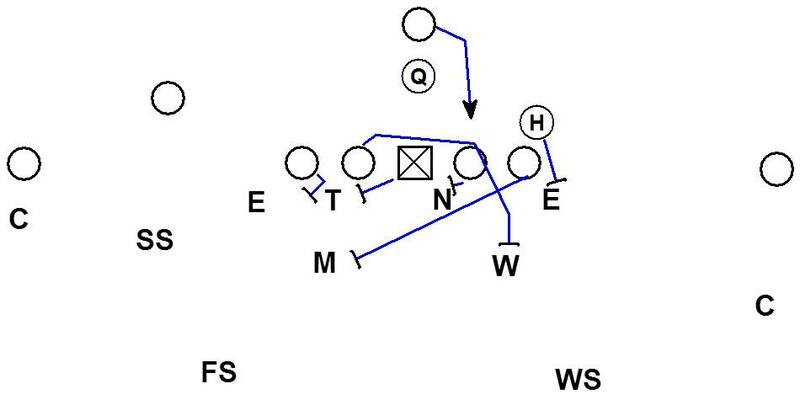 The FB is also aligned to become a pass threat to either side of the formation. Additionally, the FB is aligned with the ability to block on counter by replacing pulling offensive linemen. 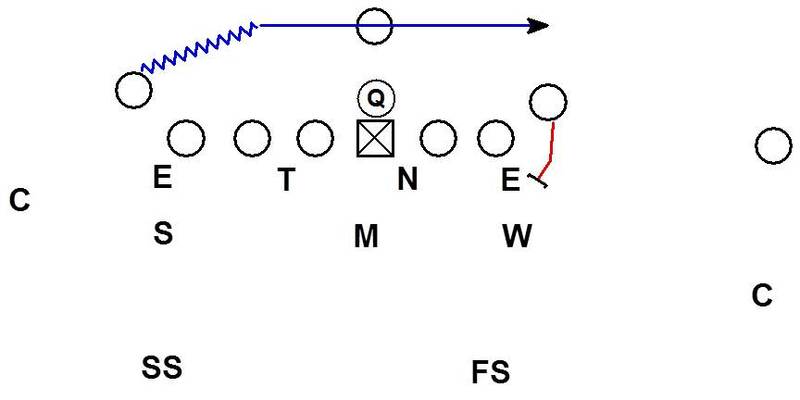 Here the FB is replacing the pulling OT on a counter play. 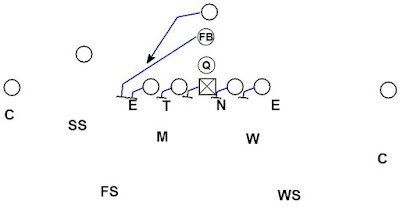 The FB's block is critical to securing the backside edge of the play. The FB is a versatile player in a wing-t scheme as are both wingbacks. A fundamental tenant of the wing-t is all three running backs can be used as blockers, ball carriers, receivers, and decoys. The wing-t can be considered a FOUR back offense. Coach Raymond references the offense’s origin as being a combination of Fritz Crisler’s Michigan single wing, Red Blaik’s trap schemes from Army, and Dave Nelson QB bootleg plays fused into one cohesive scheme. The QB is the 4th back in the attack and can threaten the edges of the defense on every play. The QB is a threat to run option, bootleg, or keep pass. What makes wing-t offenses multiple yet simple is the limited number of blocking schemes used. 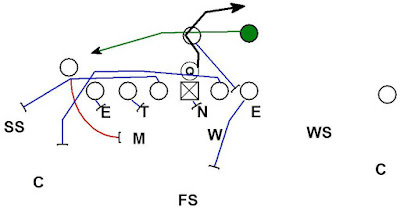 The offense uses multiple formations, motions, and backfield actions to create confusion. Meanwhile the OL are blocking only a couple of different concepts. The result is what looks like a great deal of complexity while being simple for the OL. 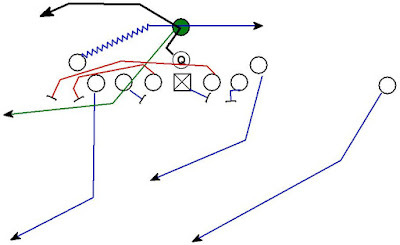 Many of the blocking schemes are interrelated. This creates the illusion to the defense that the same play is being run while the offense is running different backfield actions to attack different areas of the defense. The Wing-T is a flow offense. On any snap the offense presents multiple threats to carry the ball (4 back offense). 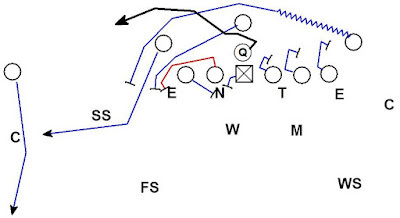 The flow of the play goes to one side of the formation. Off that flow the offense has plays that attack inside, off-tackle, outside, or away from the flow. Motion is used to add to the flow created by the offense. Putting a player in motion attracts the eyes of a defense and can influence their reactions. Motion also increases the speed of the flow. Lastly, motion can change the numbers in the offense's favor at the point of attack. Misdirection is built into the offense to add complimentary plays off of every flow. Motion can cause the defense to speed up and over react to the flow which consequently improves the effectiveness of misdirection plays. Plays that attack inside are broken up into two categories: direct shot and counter. This allows the offense to hand the ball and attack in the inside immediately (direct shot) or attack the inside of the formation opposite the flow (counter). Off-tackle plays can be run either to the TE or to the SE side. 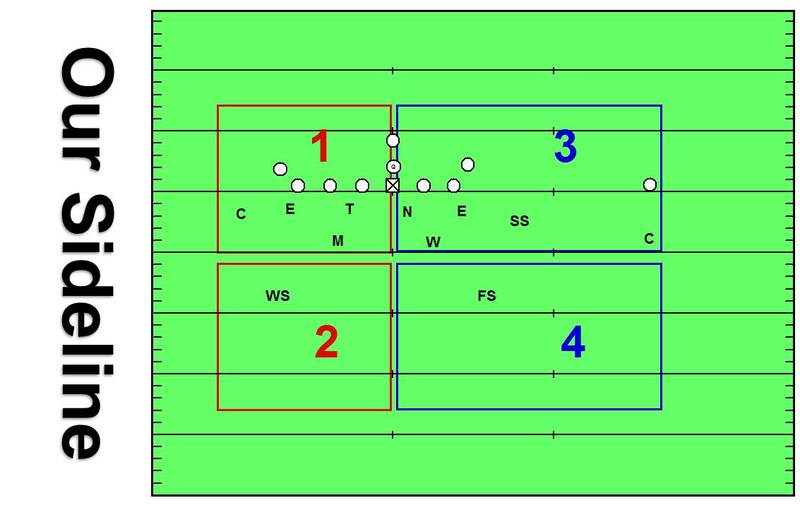 While these may be the same plays most wing-t offenses have plays they favor to a TE and those they prefer to the SE or open side. The scheme also includes misdirection plays that attack the off-tackle area opposite the flow. The runs to the outside are either blocked or optioned. The blocked plays use the leverage of the immediate blocking threats to secure the edge. 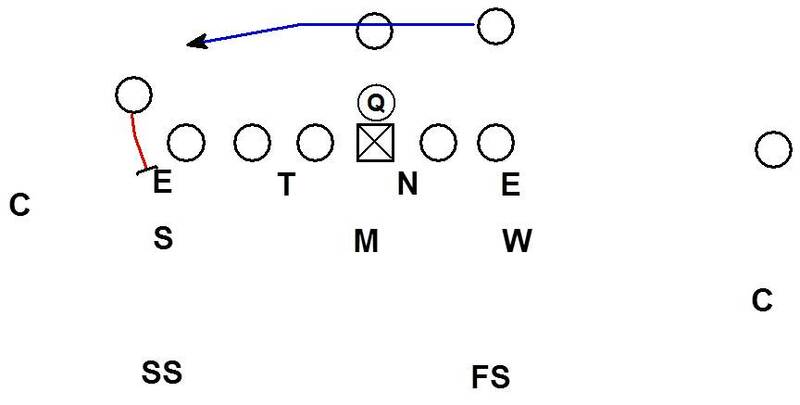 The option plays leave players on the edge unblocked to be read. The offense has the ability to attack the outside opposite the flow with bootleg plays that create a run/pass option for the QB away from the flow. 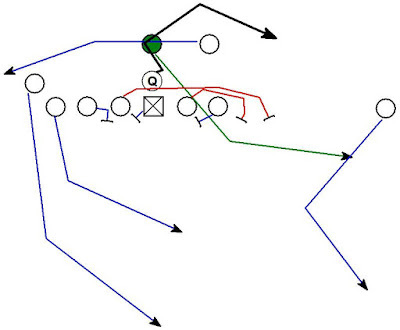 Or the offense can attack to the flow with the QB on a keep pass to create a run/pass option to the flow. 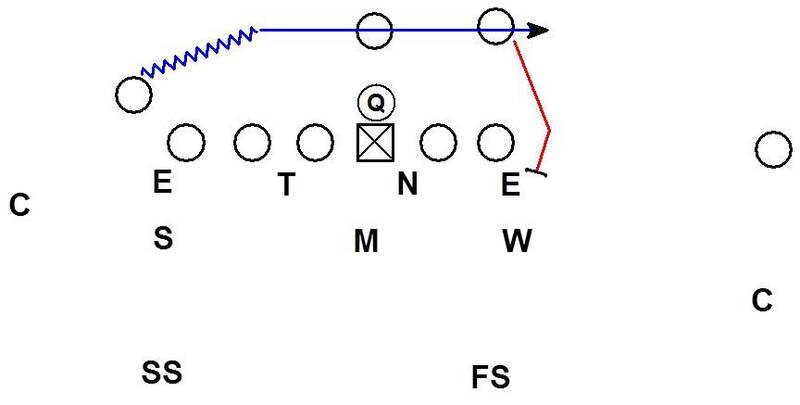 Specific plays in the wing-t scheme will be covered in a later post. What is important is the fact the wing-t is a system. Within that system plays are grouped together that attack different areas. The wing-t philosophy is to group plays into series of plays that compliment one another. These plays are run from the same backfield actions. Here is an example of a belly series. The offense can motion the right wing and attack off tackle with the FB running belly. Off the same initial backfield action the offense can attack inside with a counter to the left wing. Again the same initial backfield action with a belly option attacking the outside. Finally the offense has a play action pass off the same initial backfield action. The pass attacks the flat defender and creates a run/pass option for the QB. While the version of wing-t you are planning to defend may run different plays and different series, it is important to understand wing-t offense is a series offense. Identifying what series of plays the offense groups together is critical for the defense. By identifying the series of plays the offense is likely to run the defense can anticipate what plays are coming. After breaking down the film our next step is to create profile of the offense by formation and motion. The starting point is the base formation. How will we line up to the formation? What do they run with no motion? Next we look at the motion from that formation. Here is fly motion by the wing to the SE side of the formation. The SE side perimeter defenders must be ready to stop sweep. The TE side defenders must be ready for hand to hand counter coming back on motion away. On fly motion by the wing toward the TE, the DE and LB to the TE must be ready for G Belly. The perimeter support to the TE must be ready for sweep. Away from the motion must be ready for boot. Now we have a starting point for what series of plays the offense like to call based off backfield actions. By breaking down every formation and motion we can start to build a plan. The formation is where we are going to line up. The motions are the indicators of what our defenders need to anticipate will happen next. The formation/motion diagrams is the starting point for understanding the offense's series and starting to establish our plan. The coaches on the field watch the half of the formation closest to our sideline. That is the area they have the best view to see. One coach is assigned to watch the core (Area 1). A second coach watches the near side secondary (Area 2). The far side of the formation is the responsibility of the coaches in the box. Their vantage point from the box allows them to see the area on the far side of the field much better than the coaches on the field. 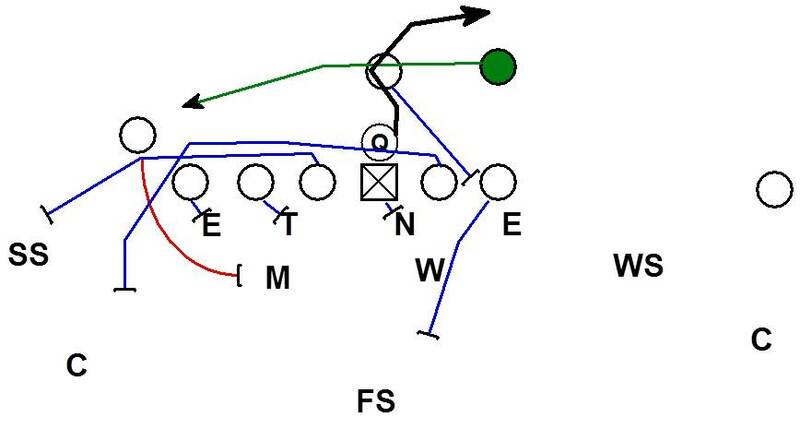 One coach watches the far core (Area 3) and one watches the far side secondary (Area 4). Other coaches will be assigned other things to watch but the 4 coaches with areas to watch in the eye chart MUST see what happens in those 4 areas. By assigning this eye chart we avoid the dreaded "I wasn't watching that..." scenario. Each area coach knows what is likely to happen in their area based on scouting report and game plan. If our reaction to the series is incorrect the area coach watching the area where a mistake occurred should know. If the series isn't what we thought based on scouting report we will know based on what the 4 area coaches are seeing. This allows us to begin to alter the plan and communicate to the players. Understanding series football is critical to our game planning and in game coaching against a wing-t offense. Future posts on defending wing-t will look at common wing-t formations, motions, and plays. Strategies for defensive alignment, assignment, keys, run fits, run support, and coverages with be covered as well. Great Post!!! I have been around the Wing-T for 27 years. When we face a Wing-T team, it is always so hard because I know what they can do if we do . . . I really like the 4 areas for the coaches. I look forward to your next post. Thank you!